If you are reading this article, the chances are that unfortunately, you have been diagnosed with some type of Arthritis, most probably Osteoarthritis since Glucosamine Chondroitin is commonly used to treat Osteoarthritis. Osteoarthritis is along with Rheumatoid Arthritis and Gout, the most common type of Arthritis. But did you know that Glucosamine Chondroitin is considered to probably be the best joint supplement for Osteoarthritis? If you have been diagnosed with Osteoarthritis or any type of Arthritis, your doctor probably has informed you that unfortunately there is no cure for this condition. You will have to deal with its symptoms for the rest of your life. And this is Glucosamine Chondroitin comes in. This supplement has efficiently reduced the symptoms of most patients dealing with Osteoarthritis. So why not give it a chance? 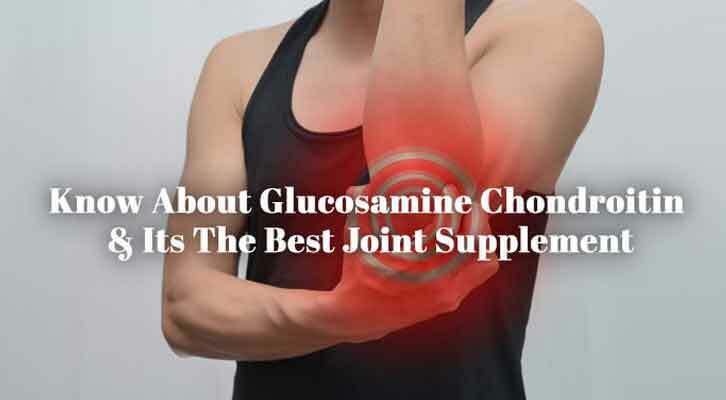 If you are feeling unsure or just want to get a bit more information on this topic, then we suggest to stay with us through the following article and find out everything that you need to know about the use of Glucosamine Chondroitin! Glucosamine Chondroitin is a combination of Glucosamine and Chondroitin sulfate that has been commonly used to treat the symptoms caused by Osteoarthritis. This supplement has shown its biggest beneficial effects towards reducing the pain and improving the function of the joint that has been decreased due to all symptoms in general such as stiffness, pain, swelling and decreased the range of motion of the joint. If you want to stay as far as you can from different chemicals, then this is the supplement for you because it is made using natural components that can be found in our body. Glucosamine is a natural compound found in our cartilage, especially in the fluid that surrounds the joints. There are many types of Glucosamine, but for the most beneficial purposes, in this supplement, it is the Glucosamine sulfate that is being used. Chondroitin sulfate is also a natural compound that as well as Glucosamine is found in our healthy cartilage. Both Glucosamine sulfate and Chondroitin sulfate can be manufactured from either a human cartilage or from an animal cartilage such as shellfish, cows, pigs etc. Both ingredients are being used because of their ability to promote healthy cartilage regeneration. And as you may know, this is the key process in a condition such as Osteoarthritis because the cartilage is one of the main structures that are being damaged due to Osteoarthritis. And there is a study published in the International Journal of Rheumatology that investigated the effects of Glucosamine and Chondroitin sulfate on the cartilage metabolism and confirmed that this combination had far more success in promoting cartilage regeneration and reducing the symptoms when compared with a simple placebo. So now that we have introduced Glucosamine sulfate and Chondroitin sulfate, let’s discuss their role in primarily hip and knee Osteoarthritis. Glucosamine sulfate and Chondroitin sulfate are commonly being used to treat the symptoms of Osteoarthritis, as we mentioned earlier. They can be used alone or in a combination. If you are living in the U.S., then your doctor will probably prescribe you a combination of these two powerful compounds. The good side is that this combination causes little to no side effects for their patients. However, not every patient is getting the same beneficial effects. This combination might not work for you, but you have to admit that the promise that it gives you is worth the try. Glucosamine alone has shown very good effects when used to treat the symptoms caused by Osteoarthritis that affects the hip or knee joint. On the other hand, when used alone, Chondroitin sulfate has not shown the same beneficial effects for the hip or knee joint affected by Osteoarthritis. A study published in the Annals of the Rheumatic Diseases compared the effects of the combination Glucosamine Chondroitin and placebo on patients suffering from Osteoarthritis affecting their knee joints. The study showed that this combination efficiently improved the symptoms that the patients have been feeling for up to 2 years. As for the other joints in the body, there has been only a small number of studies that can tell us whether or not this combination can cause beneficial effects. It is because Osteoarthritis commonly affects the bigger joints such as the hip and knee joint instead of the other smaller joints in the body that make it difficult to find the number of participants to conduct a research on. There was one study that investigated the effects Glucosamine sulfate and Chondroitin sulfate on patients suffering from Osteoarthritis symptoms affecting the hands. The study compared the effects of Glucosamine Chondroitin and placebo and found out that the combination successfully improved the pain and function of the hand among the patients. However, more studies need to be done to investigate and then confirm whether or not Glucosamine Chondroitin has beneficial effects on the other parts of then body affected by Osteoarthritis. However, this combination is not something that you can take on your own. You need to consult your doctor in order to find out all the potential beneficial but also side-effects and if there are any risks as well. Make sure to consult your doctor especially if you have blood sugar problems, are allergic to seashells and seafood, are pregnant or nursing a child. Osteoarthritis if left untreated will create many difficulties in your everyday life, enabling you to follow your normal routines and leaving you to deal with swelling, stiffness, and pain among the other Osteoarthritis symptoms. So why suffer through such experience? Why not try something that has been used and sworn by many patients suffering from Osteoarthritis? The combination of Glucosamine Chondroitin is made using natural ingredients and promises to treat your symptoms and provide you with a chance of living a more normal life. Are you ready to improve your life and say goodbye to those annoying symptoms? Why Does My Jaw Hurt For No Reason? Best Joint Pain Supplements: Worth the Money or Is It Just a Hype?